This is a beautiful hand colored 1816 map by Edinburgh cartographer John Thomson depicting the Northern Hemisphere projected on the plane of the horizon of London. It covers all of North America, Europe, Asia and Africa as well as the northern parts of South America. Impressive detail encompasses both political and geographic features. The routes of Captain Cook are noted throughout. The map also notes the Bherings (Bering) Island off the Kamchatka Peninsula with a note reading 'Where he died in 1741.' In Africa, the mythical Mountains of Kong are shown extending eastward to join with the Mountains of the Moon – mythical source of the Nile River. Exhibits a general lack of information regarding the Arctic and connects Greenland with the mainland. Seems to leave the possibility of a Northeast, though not a Northwest, passage open. This map was engraved by J. and G. Menzies and published by Baldwin and Cradock in Thomson's New General Atlas. 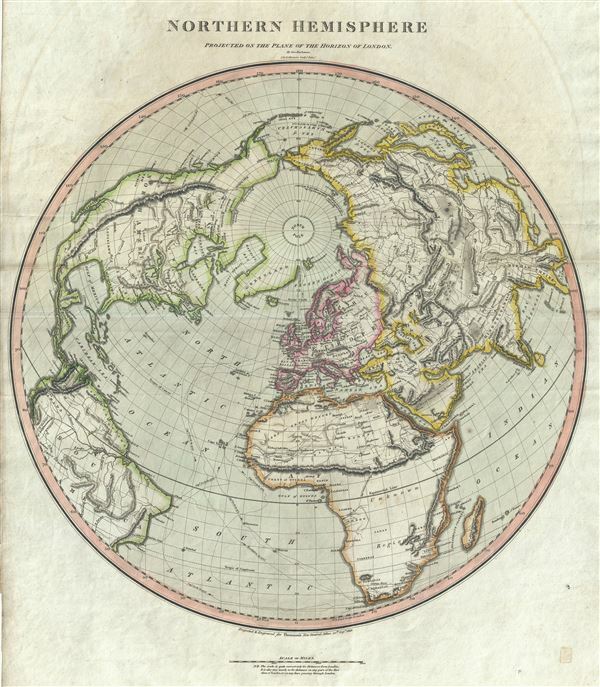 Thomson, J., A new general atlas, consisting of a series of geographical designs, on various projections, exhibiting the form and component parts of the globe; and a collection of maps and charts, delineating the natural and political divisions of the empires, kingdoms, and states in the World. (1817 edition). Very good. Original platemark visible. Original centerfold visible. Minor toning and foxing. Rumsey 1007.007. Phillips (Atlases) 731. Newberry Library: Ayer +135 T4 1817.